My new book "Craft Your Stash" releases this fall! Squeee! I can't believe I got through the process of writing a craft project book - but it's all done and on its way to the printer! Published by Design Originals (an imprint of Fox Chapel Publishing), Craft Your Stash is all about enjoying the second half of that shopper's high. We all love our stash of craft supplies - now let's get crafting with it! I share lots of great ideas for organizing your stash, my must-have craft tools, and some basic design concepts to build your confidence so you can reach in to your stash and make something cool with whatever you have. You also get loads of tutorials for craft projects! I designed each project to make a dent in a particular stash - papers, beads, fabric, charms, bling, even that plastic packaging we love to recycle. Craft Your Stash is beginner-friendly, but full of inspiration for the seasoned crafter, too. 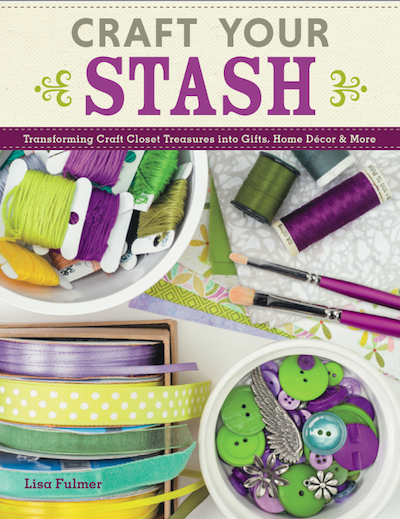 Craft Your Stash will be released in October 2014 - but you can pre-order your copy now on Amazon - yay! Can't wait to share more with you as the release date gets closer! It's the first Monday of the month - time for the Designer Crafts Connection blog hop! Click on the hop buttons under the DCC logo in my sidebar on the right. Our theme this month was "how does your garden grow?" I made these ATCs to swap with my local Meetup ATC group - just a little random paper patchwork with 1/2" strips and squares.